For a second consecutive year, winter storms seem to have largely done a disappearing act in Central California, a fact that has not been lost in the Friant Division’s initial declaration of Central Valley Project water supplies. The U.S. Bureau of Reclamation has established a 65% supply of Class 1 water for Friant Division users, or 520,000 acre-feet. No Class 2 water is being made available. Class 2 water supplies of up to 1.4 million acre-feet are not declared until the Bureau is certain all 800,000 acre-feet of the firm Class 1 contract supply can be delivered. Thanks to a few storm events that brought significant amounts of mountain snow and rain late in 2012 before conditions turned mostly dry in January and February, Reclamation’s supply for Friant is improved from the 35% Class 1 declaration made in March 2012. In an average year, about 1,250,000 acre-feet of overall Central Valley Project water is delivered to users along the Madera and Friant-Kern canals. If the new supply allocation were to hold up, total Friant deliveries would be about 41% of average. Friant’s water supply for the contract year that concluded February 28 ended up at 57% (456,000 acre-feet) in districts with Class 1 contracts. No Class 2 water has been available since 2011. Hopes for a “miracle March” or “amazing April” do not have much foundation within the latest long-term climate predictions from the National Weather Service’s Climate Prediction Center. 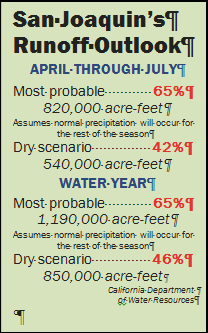 The March-through-May precipitation forecast throughout the San Joaquin Valley is below average. A cold, complex storm system did bring some welcomed valley rain, particularly in the south valley, mountain snowfall from the March 6-8 event unseasonably light. The March 1 California Department of Water Resources forecast, based on conditions before the latest storm, expects runoff to be 65% of average if normal precipitation occurs. It could be 42% from April through July, the peak snowmelt period, if conditions remain dry. The California Cooperative Snow Survey made across the San Joaquin River watershed March 1 found snowpack water contents at 65% of the March 1 average and 56% of what is considered normal on April 1, the date in which the Sierra snowpack is assumed to reach its maximum. Water content readings on the 11 snow courses with the highest elevation ranged between 58%-69% of the April 1 average while conditions on lower elevation courses were significantly less. Best conditions were found atop Kaiser Pass, at the 9,100-foot elevation northeast of Huntington Lake. There, a depth of 63.1 inches of snow yielded 24.40 inches of water content, 63% of the April 1 average.